Alan J. Auerbach, Kerwin K. Charles, Courtney C. Coile, and co-authors project that, between the 1930 and 1960 birth cohorts, American men in the top earning income quintile at age 50 will gain 7 to 8 years in life expectancy, while men in the lowest-earning income quintile will gain little to nothing, thereby increasing the gap in lifetime Social Security, Medicare, and other retirement benefits between the top and bottom quintiles by a combined $130,000 (in $2009). Changes in the distribution of lifetime Medicare benefits account for a large part of the reduction in progressivity of public programs in retirement. 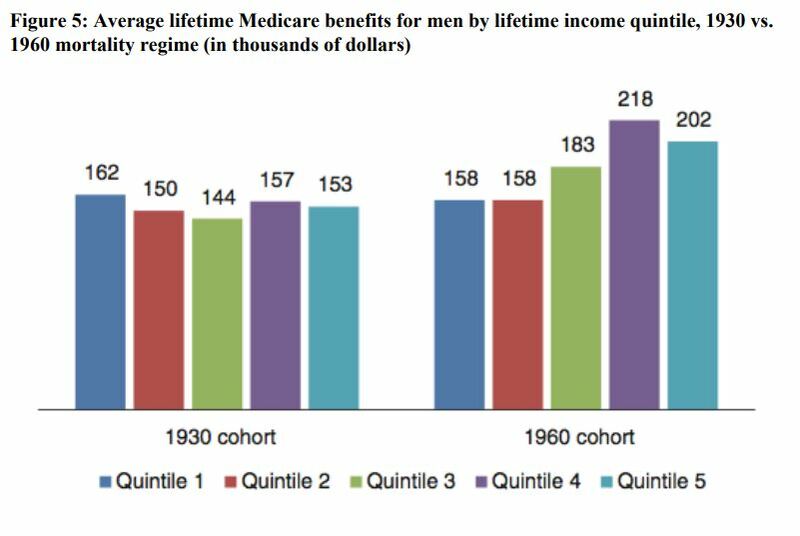 For the 1930 birth cohort, the average lifetime Medicare benefits received by men in the lowest income quintile were 6 percent higher than in the highest income quintile. However, the 1960 birth cohort is projected to see a dramatic shift, with the lowest income quintile receiving only 78 percent of the lifetime Medicare benefits received by the top income quintile. The authors, who included Dana Goldman and Bryan Tysinger of the Schaeffer Center, simulate popular policy proposals, like changing the national retirement age, taking into account these trends. They find that though most policy proposals would make net benefits more progressive, the impact of the mortality trends tends to more than offset the policy changes. Their findings point to the significant impact the widening gap in life expectancy is having on the nature of these national programs. The full study can be found at The Geneva Papers. Citation: Auerbach, A. J., Charles, K. K., Coile, C. C., Gale, W., Goldman, D., Lee, R., … & Weil, D. N. (2017). How the growing gap in life expectancy may affect retirement benefits and reforms. The Geneva Papers on Risk and Insurance-Issues and Practice, 42(3), 475-499.